TOKYO (MacHouse) – We have good news and bad news. Bad news is that a huge typhoon is headed to the direction of our neighborhood. Good news is that we submitted the 3rd software title of the month to Mac App Store about an hour ago. This new software title is called fileAbouts. fileAbouts is a desktop application that lets you keep track of files and folders. If you want to keep track of a file, we know that we can add it to the sidebar except that it can go away if it comes from a remote volume. fileAbouts won’t lose any of files or folders even if they come from a remote volume that is not currently mounted. Besides, you can create as many fields (the field to fileAbouts is the playlist to iTunes) as necessary, which makes it easy for users to organize files and folders that they frequently access. Choose one of more than two dozen field icons. Drag and drop multiple files and folders to the file browser for the selected field. Show field icons or fileitem counts on the 1st column of the file list. Let the application automatically copy the path of the selected path component into the clipboard. Reveal selected fileitems with a click on a toolbar button. Save a list of fileitem names or paths as a text file or XML file. Create a zip archive out of the selected folder. If multiple files or folders to be revealed are selected, which reside within the same volume or folder, then only the last selection will be revealed. A second table appears to the left showing the contents of the folder the user selects inside the file browser. Right-clicking on the name of a file or a folder in the second list, the user can reveal that file or folder. The application takes a better approach in detecting whether or not the selected file item is a folder and not a package. The user can now directly double-click on a file (or a folder) in the file browser to be revealed. There is no copy of software for evaluation purpose at this time. 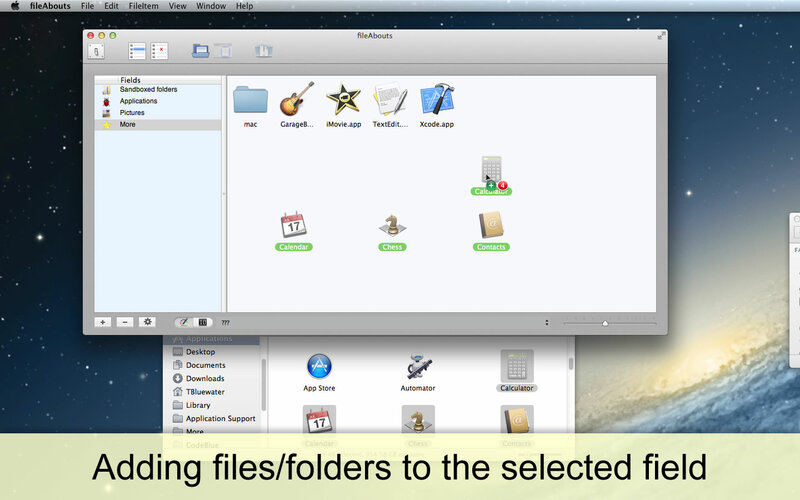 Please download and use fileAbouts Lite as a demo version when it’s available at Mac App Store. Meanwhile, if you regularly review Mac software, you may be eligible for receiving free coupon codes, which can be redeemed at Mac App Store. Click here for more information. fileAbouts is a product of MacHouse.